Once the Mecca of jazz music, now nothing but office buildings. 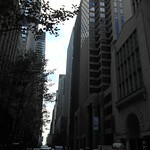 Today, 52nd Street between 5th and 6th Avenues in Midtown Manhattan is nothing but skyscrapers. People come here to work, do some banking, or have a $5 cup of coffee. But for much of the first half of the 20th Century, this was where you went to hear the best jazz musicians in the world. 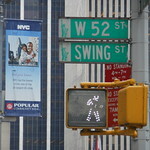 Now it's known to many as "Swing Street." 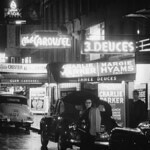 Thelonious Monk even wrote a number about the scene called, "52nd Street Theme." It's now a jazz standard. 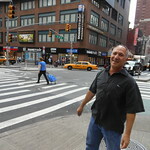 "You didn't have to say 52nd Street, you just said 'The Street,'" says Big Apple Jazz Tours founder Gordon Polatnick. "That's pretty amazing, because you could probably be in Pittsburgh and say 'I'll meet you on The Street next week,' and you'd know it was 52nd Street." Polatnick says Swing Street's former brownstone speakeasies were never big enough to host big band music on a regular basis, as you might think the name "Swing Street" would suggest. Instead, he says, it was more of a place to hear artists like Billy Holiday and Miles Davis without breaking the bank. "If you were a college student and weren't able to afford a lot, you could still nurse that drink all night long and keep a low profile and still see a lot of musicians," Polatnick says. 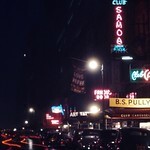 In the 50s and 60s, as Midtown Manhattan became more commercial, the jazz scene shifted to the Village and Harlem. But the legacy of Swing Street lives on in the music. Note: This is Part Three of WFUV's series on the New York City Music Trail. There are dozens of spots all over the five boroughs that embody the city's rich musical heritage. In 1992, the NYC Grammy Awards Host Committee and the city decided to map them. The NYC Music Trail includes legendary "sites of sound" like Carnegie Hall, the Apollo Theater, Tin Pan Alley, CBGB, and Lincoln Center. But all this week, we're visiting some of the places on the trail that likely haven't crossed your radar yet. Tomorrow, we'll visit the final resting place of one of America's great composers - Scott Joplin. You can hear each installment live on WFUV 90.7FM at 7:40AM and 3:30PM. Swing Street, May 1948. Photo by William P. Gottlieb. 6 years ago ago by gjneher. Swing Street c. 1948. Photo by William P. Gottlieb. 8 years ago ago by gjneher. Swing Street, July 2012. 6 years ago ago by gjneher. Swing Street, July 2012. 6 years ago ago by gjneher. 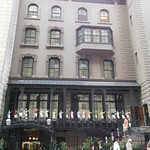 21 Club - The only brownstone and former speakeasy remaining on Swing Street. 6 years ago ago by gjneher. 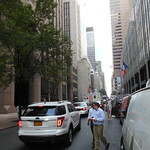 52nd Street and 6th Ave.
6 years ago ago by gjneher. Gordon Polatnick, founder of Big Apple Jazz Tours. 6 years ago ago by gjneher.